I’m a part of the Who’s Who in Black Canada (WWIBC) team and together we recently attended this Black History Month event that was presented by TIFF and Black Artists’ Network in Dialogue (BAND). 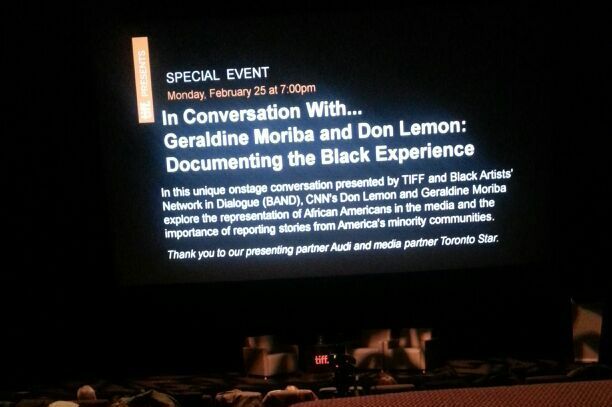 We were there to listen to Geraldine Moriba and Don Lemon speak about their take on Documenting the Black Experience. As they both have successful careers with CNN – Don as a news anchor and journalist and Geraldine the (Canadian!) 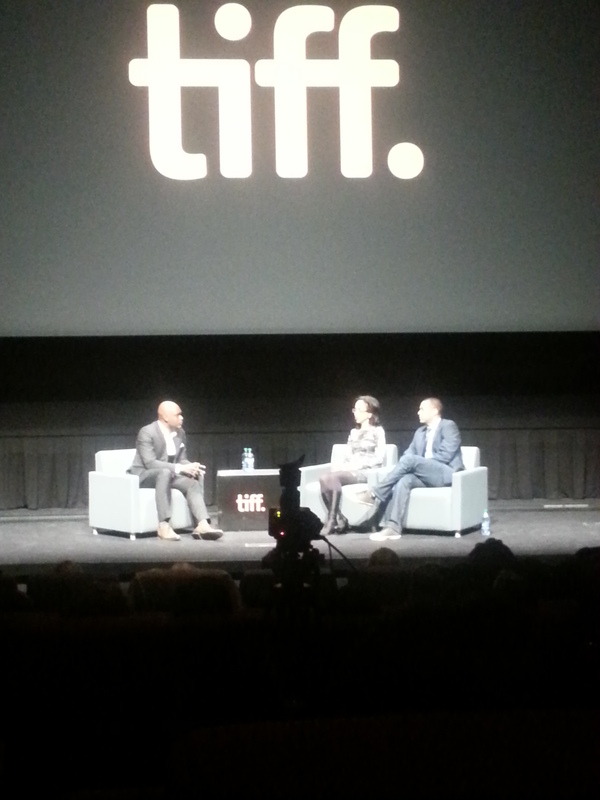 Emmy Award-winning producer of In America – the sold out theatre was eager to hear what they had to say. What an incredible evening it was. Don charmed us with his humour and Geraldine with her wit. Like many of us, they are very passionate about the issues that are faced by the black community, but they are in the position to explore the cities and neighbourhoods and tell the stories. We were shown clips from their shows Black In America and CNN Newsroom. The host of the evening Cameron Bailey (check out his WWIBC interview) asked them about their views and experiences through the work they do. There are a couple stories and clips we saw that really stuck with me. One being that of the civil rights photographer Ernest Withers who captured every memorable moment during that era, including appearances by Martin Luther King Jr. Though the photographs of MLK Jr were the pinnacle of his career, it is now being marred by the documents that were released indicating he was an FBI informant. This man who helped shape American history is now being called a “mole”. Then there was the Almight Debt Black In America segment where Soledad O’Brien interviewed pastor TD Jakes who believes that debt within the black community is a bigger problem than racism. Many of us do in fact live our lives as if we have no financial hardship, but in reality there is, yet we see the need to keep up the appearance of having “made it”. There was a Q&A portion when members of the audience could ask questions or share views. With every question it became apparent that the shared concern was the effect the violence has on the black community, mainly the youth. The one point that was raised throughout the night, is that although much of the violence is indeed glorified by the media, there is a growing issue that the community itself must take responsibility for. We can not point out the violence without trying to collectively find a solution. We are responsible for our youth and the mistakes they make. It really wasn’t anything that any of us hadn’t heard before, but it was nice to be on the same level (so to speak) as members of the media. Plus, it is always nice to be in that forum setting where you can see/hear your views being shared and knowing the concern is palpable. We had the pleasure of meeting Geraldine Moriba after the talk, and she is as down to earth as she had been on stage. Even with her hectic schedule, she wanted to be interviewed and profiled on the WWIBC site, saying “I’m Canadian! Why aren’t I profiled?”. So look out for her interivew on the WWIBC site! So cool that this was done in such an open and interactive way 🙂 Great review! You’re absolutely right, E! As much as this topic has been discussed and aired, the new perspective was great. Thanks for reading and commenting! The issues in our community are so many and so ingrained, it is good to hear people on the same page. Now we just need to jump into action. I suppose the first step is acknowledging that there is a problem, but it just seems that it’s always the same people acknowledging. I really enjoyed reading this post, Chris. I really appreciate that you included Pastor Jakes’ comment about debt being a bigger problem than racism because it is not immediately obvious (which is part of keeping up appearances, whether conscious or not). Your point about violence also really spoke to me. Thanks Seph for reading and especially for your feedback. I think once we can all open our minds we’ll see a lot of things change. We want to change and at the same time fear it. The problem of course extends beyond the black community.